Standard plumbing vent pipes are 2″, 3″, 4″, 5″ or 6″ inside diameter. Measure the inside diameter of the plumbing vent pipe. For non – standard plumbing vent pipes please contact us. 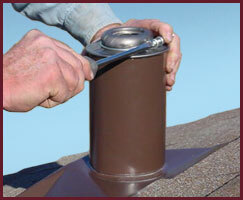 To order the correct plumbing vent flange first determine the pitch of your roof. Our flanges are adjustable and made to fit all roof pitches from flat to steep 15/12, the roof angle of an A frame. 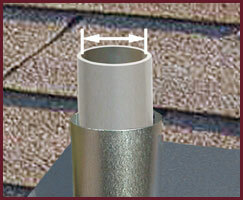 Our replacement flanges do not require removing the old flanges or the tearing off of any shingles to install. Follow these simple steps for installation, together with your own common sense about working up on a roof. The slant, or pitch of a roof is commonly expressed as a fraction: 4/12, 6/12 which is shorthand for how much the roof drops down from horizontal in one foot. 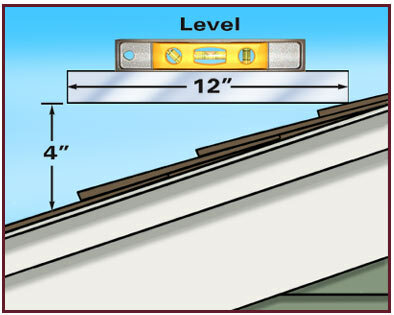 To get this measurement you’ll need a yard stick, ruler or stick you’ve marked off 12″ from one end and a level to keep it horizontal while measuring down to the roof surface. One more time: Climbing around on your roof is a very dangerous business. Do take every precaution and pay attention to what you are doing, where, every second you’re up there. Place the end of the ruler on the roof surface. Make sure it is horizontal using the level. 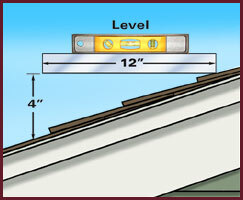 From the 12″ mark, measure straight down to the roof surface and note that number. Say that distance was 4″, your roof pitch is 4/12. Keep the number handy, along with the inside diameter of your plumbing pipe for ordering the correct roof vents for your application.